Disney’s favorite voice, Sterling Holloway, returns for the first time since ‘Peter and the Wolf’ (‘Make Mine Music’, 1946), to lend his voice to a child-delivering stork like he did in ‘Dombo’ (1942). 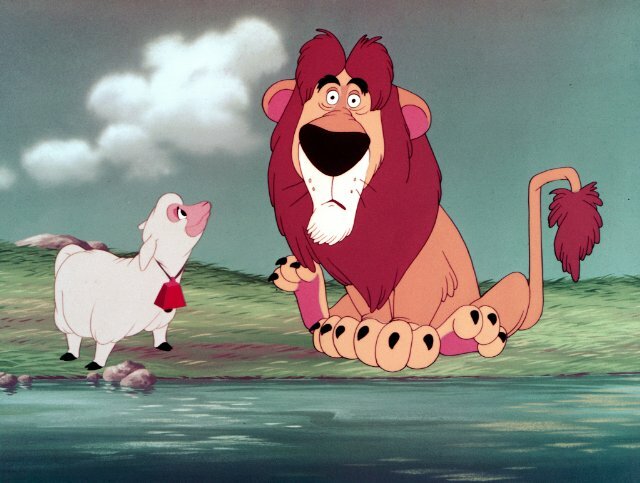 Holloway tells the story of Lambert, a lion cub who’s accidentally delivered to a mother sheep. Because he’s different, he’s bullied by the other lambs, and he grows into a cowardly lion, until he rescues his mother from the clutches of an evil wolf. Like the similar ‘Morris, the Midget Moose‘ from two years earlier, the story of ‘Lambert, the Sheepish Lion’ is slow, sickeningly sweet and terribly unfunny. What Lambert eats during his stay among the sheep remains a puzzling mystery. The cartoon’s only delight are the facial expressions on the adult Lambert.